Dana Milbank at the Washington Post ventures a guess as to why Sarah Huckabee Sanders wants the cameras off during press briefings. It’s easy to see why Sarah Huckabee Sanders wants the TV cameras off during her White House news briefings. There is, for one, the matter of her boss constantly proclaiming things that range from the inexplicable to the patently wrong. There’s also the metastasizing Russia scandal, which keeps rendering previous Trump White House statements inoperative, as Richard Nixon press secretary Ron Ziegler used to say. But above all is a more simple explanation: Sanders has no earthly idea what’s going on in the White House she purports to represent. And so, at Monday’s off-camera briefing, she stood on the podium, frequently cocking her left eyebrow and raising the left corner of her lips to convey displeasure at the line of questioning. Then, as frequently, she opened her mouth and, with a heavy Arkansas twang, said a lot of nothing. Then came a barrage of questions about Donald Jr.’s newly reported meeting with the Russians, which negated, as CBS’s Major Garrett noted, the White House’s “long history of blanket denials” that there had been campaign contacts with the Russians. “There was simply no collusion,” she said, eyebrow cocked and lip corner raised. “That’s a different question,” Garrett pointed out. Sanders repeated that there wasn’t any collusion. Or a semblance of dignity. The humiliations that ruined Sean Spicer will do the same to Sanders or whoever fills the role. Trump doesn’t seem to tell his people what he’s doing, if he knows himself. ABC News’s Jon Karl published a list last month of 26 times Sanders and Spicer said they would “get back to you” but never did. There are, surely, many more. But that’s no excuse. Sanders has agreed to interpret the nonsensical and to rationalize the indefensible. Like Spicer, she will fail. Sarah Sanders Huckabee, from the moment I first saw her on a televised briefing, reminded me of someone in public life who had the same mannerisms. It took a while but I finally figured it out: John Ehrlichman, Richard Nixon’s assistant for domestic affairs. 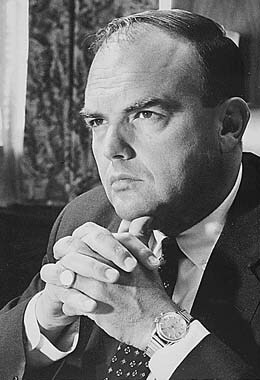 Ehrlichman was one of the Nixon staff who got caught in the Watergate scandal and served time in prison. This photo is as close as I could get but there are better examples of Erhlichman’s mannerisms out there.